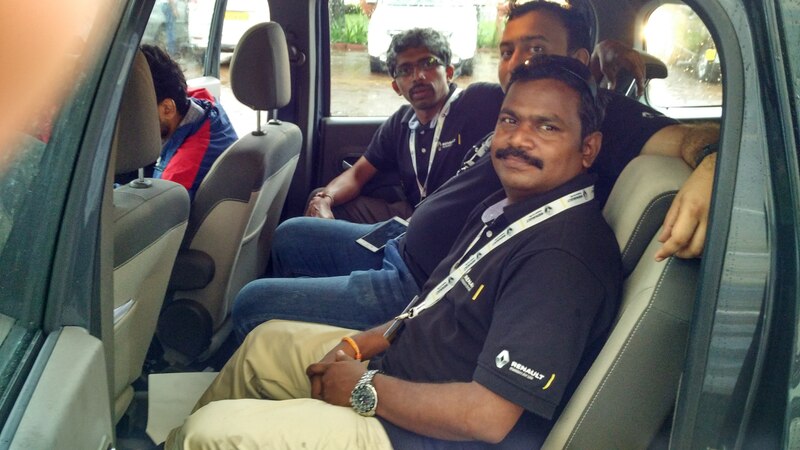 The Renault LiveLodgycal drive was one the best we had in recent times. Fun and Goa and more importantly the car made it very very enjoyable. 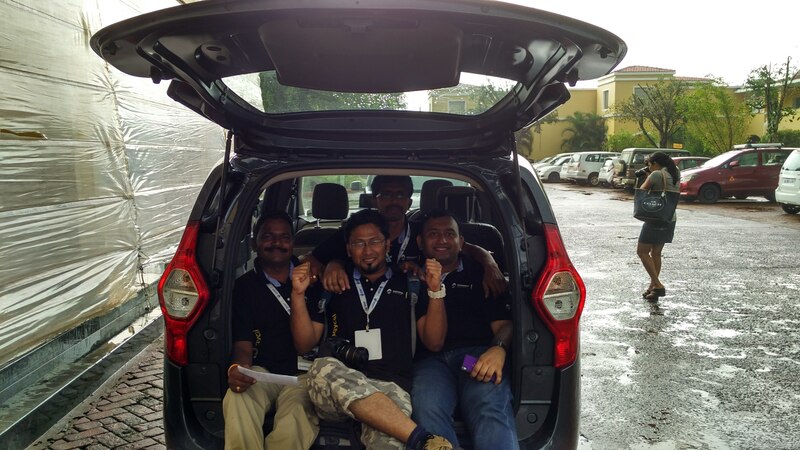 Its Goa time, and another blogger meet with another new car! Its become a habit with Blogadda getting you drive the cars around the picturesque Goa. So when Harish calls you dont say NO! Who would deny themselves an opportunity to be amongst 40 of the best minds from the country. In a sense these meets have enriched the bond of friendship cutting across the country and have given a different perspective on what blogging is all about and the kind of passion it evokes in each one of us. Probably I was the first to step out of home, early in the morning given I had to reach Chennai and then get to Goa! In between the WhatsApp messages and tweets which incidentally was trending for sometime with the #LiveLodgycal hastag, we were getting set to what would be a great event the next two days over the weekend. 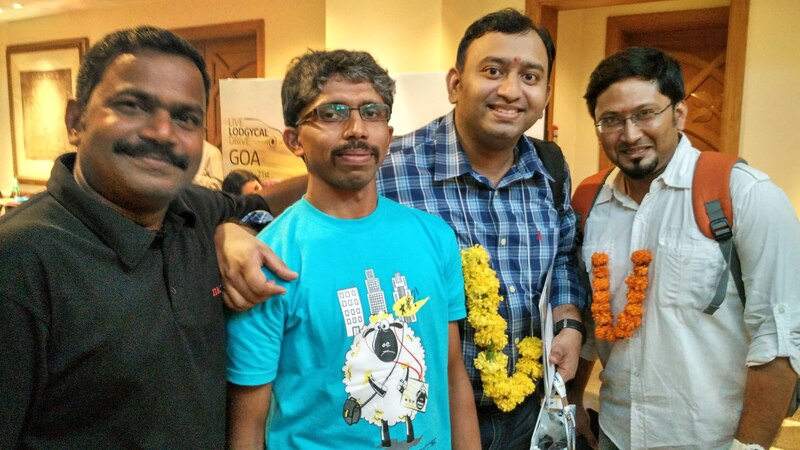 I am gonna write about the awesomest gang of the Blogadda in a separate post. Thank you all for such a well planned and well executed eventful meet that we were in. Hmm the prizes were awesome and that was the icing in the cake for those who got them and deservedly so. So this meet let me tell you was courtesy the Renault India, the car manufacturer with a legacy from France. If you know the SUV which set the market rolling by the name of Duster then you know who we are talking. The foreign brands take some time to get to the bottom of Indian mind and heart and so too Renault has captured the imagination of the car lovers with its earlier versions. 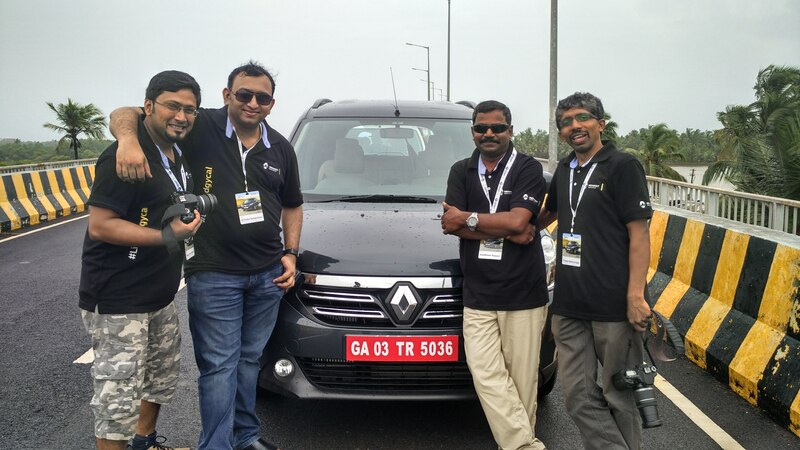 This time we got to test the all new Renault Lodgy, well it got to be Lodgycal and turned out to be one. After reaching the hotel and warm welcome and some unofficial meeting up later we all assembled to listen to what the car or the MPV as it is called is all about. The evening started on a wonderful welcome note from the teams at Blogadda and Renault India. We also had a wonderful intro session on all the bloggers and the teams present there. I was a part of the Team Fleeting Four – accompanied by the traveler with the name @payaniga Prashanth, the ever funny Doctor @pythoroshan who blogged one of the serious issues in the country about his profession and the ace photographer and blogger Sammy @deckle_edge. Renault Lodgy: The Car with a history! An MPV from the house of the 116 year old company that pioneered the Turbocharger, the first Hatch sedan, or the steering mounted controls to name a few has done a marvel in the way they have taken Lodgy to the Indian Market. First things first. The Renault are the pioneers of the MPV cars and that lends a special significance when you try out the car and there is an ample evidence of that factor. It shows when a 117 year young company does things its own way. Be it the turbocharger or the first sedan, the steering mounted controls, the first hatch back or the first gear box, there is history and a legacy to live by. Monococoque : The F1 fan in me was so happy hearing the monocoque contruction of the MPV Lodgy. It adds to the safety by default. Well you need to know Metallurgy well enough to do that monocoque is a single steel construction of the body. Diesel Only Option: Diesel is standard in two variants one with 85 PS generating a maximum torque of 200 Nm @ 1900 rpm. 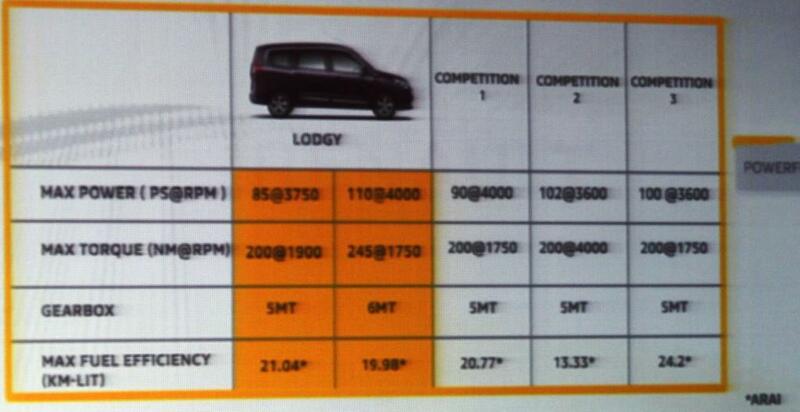 Another with 110 PS with a maximum torque of 245 Nm @ 1750 rpm and comes with a 6 gear box. It has shown a great flair by going only diesel in Indian circumstances and the mileage is pretty decent if you go by ARAI. Leaves the competition by a mile. There is a lot of thought which has gone into the design of the car suiting it to the Indian way. 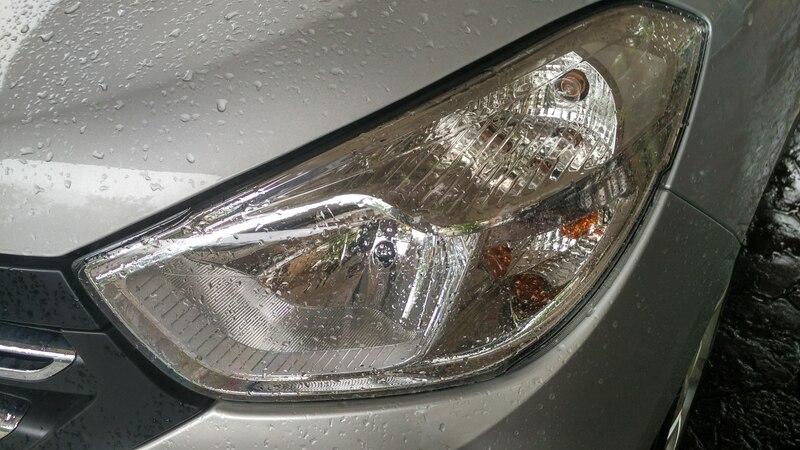 The car has a nice front grill with the logo, and head lamps are pretty and fits nice in the view. The car is nice and just have a look at the interiors and the dont disappoint, class interiors and nice feel of the seats and good feel on the dashboard. The touch music dashboard – and the controls on the steering are easy to use. 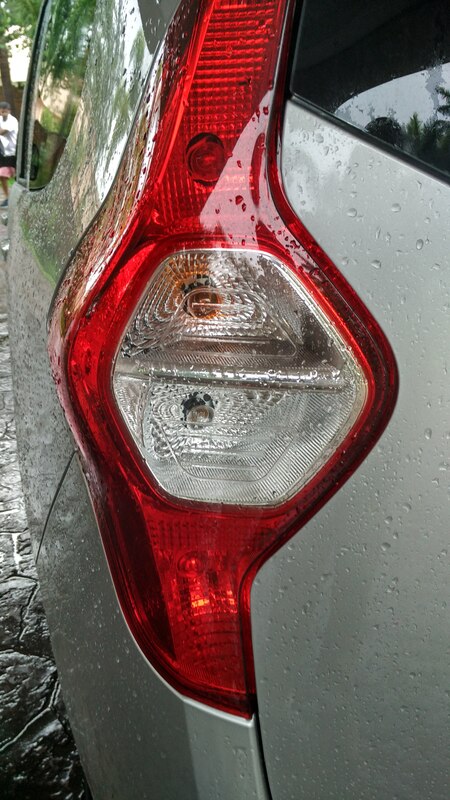 Well the indicator and wiper are under left right combination as usual Renault style. So without much of the writing I am thankful to my team mates for recording this video… all the aspects of the car in these videos! Hmm its one spacious car and well we have to wait and see what the people have to say about the rear, I loved the lamps at the rear but found it very squarish for all the aero styling in the front. But you know they were the first MPV. The drive was good probably the first two gears need a bit of response but once you get going you are in for a ride. I can understand the first two gears are for the city driving and getting you out to the highway! The seat variations and the boot space are very comfortable and India will be all arms wide open welcoming such a family gaadi to their household for sure. 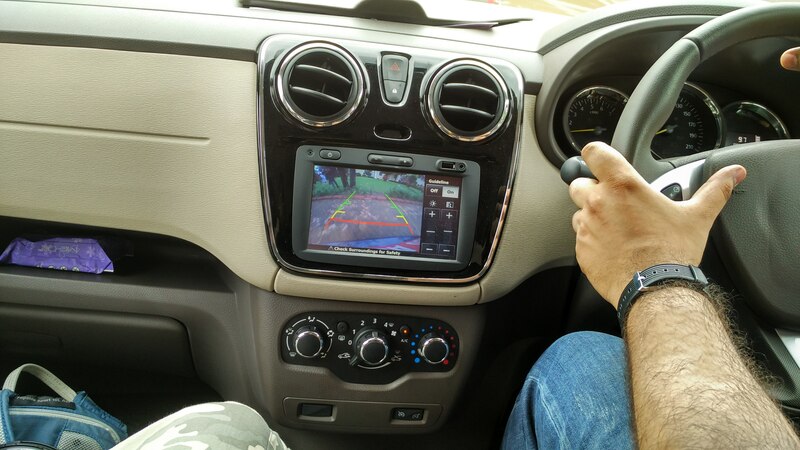 The touch screen navigation system, the reverse gear on board camera and a host of features will make you feel luxurious on the car. Impressions: Very responsive and a value for money car – spacious and you are sure to get travelling at impulse. It doesn’t sound like a diesel car, check out the Lodgy on a test drive you will agree with me.